Seafood seems like everyone’s passion in this city of Angels, but where to go for the real recommended seafood in Bangkok? But what if you don’t have the time to travel all the way to the nearest seaside? 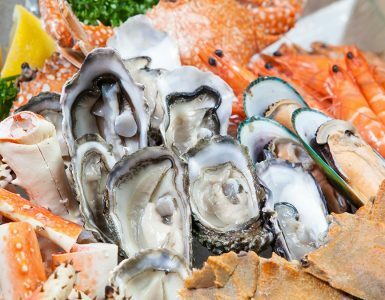 Novotel Bangkok Platinum Pratunam has the answer: Head straight to The SQUARE and its famous seafood buffet selection, of course! 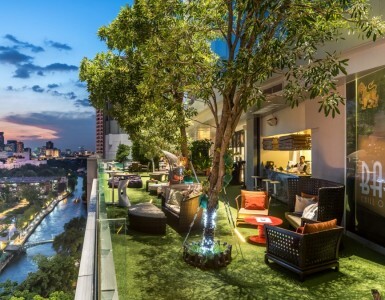 Right in the heart of town at the Pratunam intersection, you can even get some shopping done at the glitzy malls at nearby Ratchaprasong or The Platinum Fashion Mall and then head straight up to the 6th floor of the Novotel Bangkok Platinum Pratunam. Once you step into the relaxing and welcoming ambiance of The SQUARE, you’ll be drawn to the expansive selection of fresh seafood available to enjoy in many different ways. Every evening, our Completely Crab Dinner Buffet awaits you with different kinds of crabs for you to enjoy! Sunday Brunch is also a good choice for seafood lovers! Start with fresh oysters and poached seafood on ice that include Alaskan king crab, NZ mussel, blue swimmer crab and prawns and try them with our spicy seafood sauces. Or pick and choose which seafood you’d like to see prepared right before your eyes at our BBQ grill section like rock lobster, clams and seafood skewers, along with a meat selection that spans beef, pork, chicken and lamb. Taste your way through our hot station, which showcases a rotating selection of seafood and meats prepared various ways such as stir-fried curried crab, baked glass noodles and prawns, NZ mussels in green curry and more! Freshly-baked pizza, traditional Thai appetizers and a sushi and sashimi corner are also represented, along with our renowned Chinese selection that includes the classic trio of roast duck, BBQ red pork and crispy pork belly. Dessert is a treat for those with a sweet tooth, with tender and fragrant bread & butter pudding a favorite with young and old and a great variety of home-made cakes, ice cream, seasonal fruit and to tempt the senses. Every Sunday from 12:00 pm – 3:00 pm is your chance to try the buffet that has the recommended seafood in Bangkok that everybody is talking about! 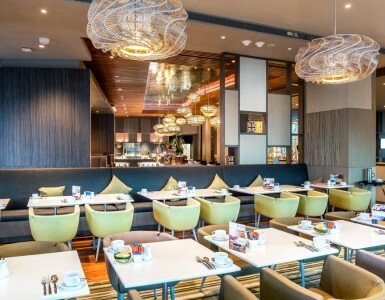 The SQUARE at Novotel Bangkok Platinum Pratunam is ready to welcome you and your appetite today.